The president, Bill D’Alessandro, opened the meeting with the pledge to the flag and a minute of silence for our past members and our service people. He left the usual agenda to have the speakers make their presentation first. 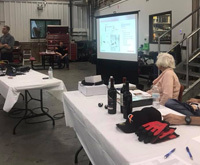 He introduced Bob Albano, business Unit Sales Manager, Fire, Rescue/Agricultural and Pete Catarelli, Regional Service Manager of Hendrickson Commercial Vehicle Systems known to our members for their Suspension Systems. The company was founded in 1913 as a truck manufacturer. They branched out to component parts and even built fire trucks – they sold that division in 1976 to KME. They are the world’s largest suspension manufacturer. The speakers had a slide presentation and interacted with our members for more than an hour. Our members now have contacts to answer any of their suspension questions. Our president, Bill D’Alessandro, asked Kit Cafaro to read the minutes from the last meeting – April 12 at Bay Shore FD. There was one correction – the Vice-President, John Mannetta, is working on a brake class (not and air-conditioning class) for October or November. After Kit made the correction, the minutes were approved. She told the group that Ernie Kussmaul passed away on April 28. She represented our membership at his viewing. Our treasurer, Barbara Connelly reported that we now have 121 members and our treasury is in good shape. She distributed LIEVT shirts to the members who were present. 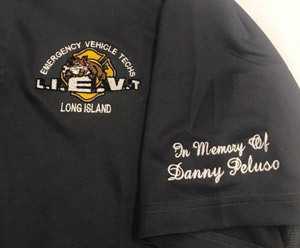 “In memory of Danny Peluso” is embroidered on the sleeve. The General Motors/Chevy class will be held on June 25 at the Coopiague FD. The welding class will be on September 17 at the West Hempstead FD. Our annual barbeque will be at the Wantagh FD June 28 meeting. ROM and Safe Fleet will make a presentation. Our members are asked to wear their new LIEVT shirts or a black shirt for a photo op. Our officers presented framed certificates of appreciation to Bob Albano of Hendrickson,. Joe Kiciski for the commissioners of the Westbury FD and to Artie Koenig, Mike Prignano and Matt Dibnuzzo of Westbury Water. The Water group wore their LIEVT chefs’ hats for the presentation. A raffle was held with donations from Hendrickson Suspensions, Hendrickson (our member), Rescue Vehicles and Fire Research.